Nature's Comeback is about more than just bison. We have free range chickens that have access to over 40 fenced acres. 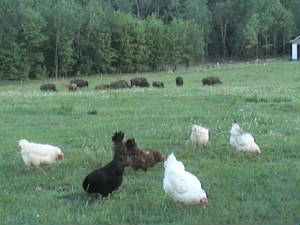 Yes, they enjoy the same pastures as the bison. And very often at the same time. One of the wonderful by-products of our girls is the large brown eggs with the golden yolks. And believe me, there is nothing like the taste of a farm fresh egg. Nature's Comeback offers naturally raised produce and vegetables as available. None of our fruits or vegetables are sprayed with chemicals or non-organic fertilizers. Composted waste products are our only fertilizers. If you're in the area stop by for some fresh produce. We sell bison By-products such as headmounts, skulls, horns, bones and hides. Besides the finest meat available we also sell breeding stock. We keep only animals that thrive on a straight grass and hay diet. Much like natural selection. We have blood stock from all around the country. All must make the grade to continue to live on the ranch. You've gotta see 'em to believe 'em! If you have any questions about any of our products please give us a ring or email.